Contrary to popular belief, there can be such a thing as too much ramen. 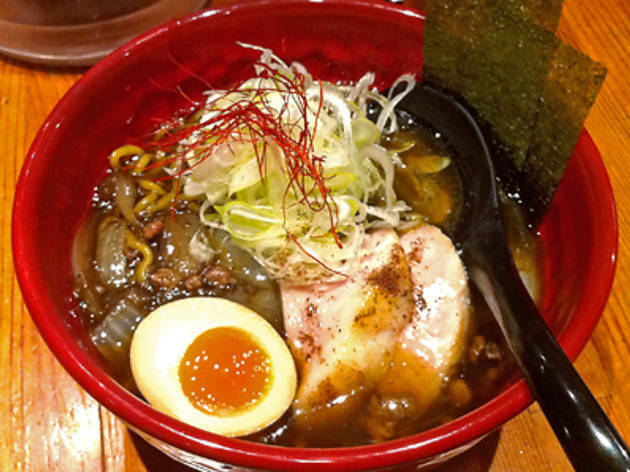 If you've overdone it on the more conventional flavours and are looking for something a little bit more exotic, Shodai Keisuke, located inside the Shinatatsu Ramen food hall under the tracks at Shinagawa Station, could be the answer. Owner Keisuke Takeda spent over a decade working in kitchens in France, plus an extra five years learning the art of washoku, and he's put his skills to good use in conjuring up a distinctive black, miso-based ramen soup. 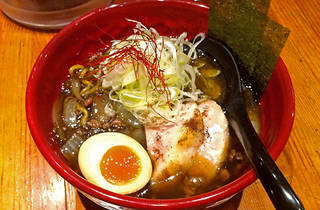 Blending seven kinds of miso and bamboo coal in a meaty broth laced with shrimp oil, this singular bowl of noodles is finished off by a perfect balance of toppings, including chashu pork slices flavoured with rock salt, rare ajitama (soft-boiled egg), scallions and nori seaweed. If you're feeling especially hungry, we recommend the tontoro aburi chashu kurokiwami, accompanied by a bowl of rice to soak up any leftover broth.